Poliomyelitis primarily afflicts infants and children. It can, however, be contracted at any age. Paralysis and mortality is highest in the first 5 years of life. Therefore,early immunization is important. Biopolio® (live attenuated poliomyelitis type 1 and type 3 viruses—Sabin strain) is used for active immunization of infants and children against Poliomyelitis. 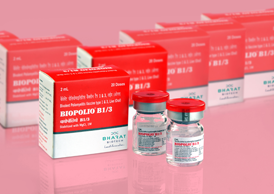 Bharat Biotech is WHO Prequalified supplier of BioPolio B1/3.